Brown bagging it? Did you see that title? Is Pop planning on taking me to work and eating me for lunch? Isn’t that what the humans mean by brown bagging it? Gasp!!! This kitty hasn’t had many opportunities to curl up inside a paper bag recently. TW uses all canvas bags which I can’t go near cos they have handles. I know my first year here I got tangled in one of those handles but I’ve learned. This kitteh wasn’t born yesterday and she’s very smart. After I disappeared on my next adventure, that bag of wind TW was left, um, holding the bag. HAH! I slay myself! 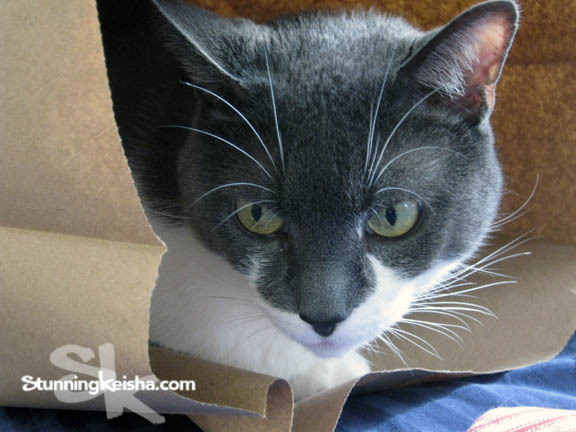 Do you like paper bags or are you more a mixed bag type o’ cat? Truffles and Mudpie are box ladies, but Tara loved paper bags. Although not to get inside...she would crush them down to make a bed out of them and lay on top!!! We never get to play with the paper bags here - they are folded and put away too fast! I just want to say, also, they are one of the VERY few things that get folded and put away around here. 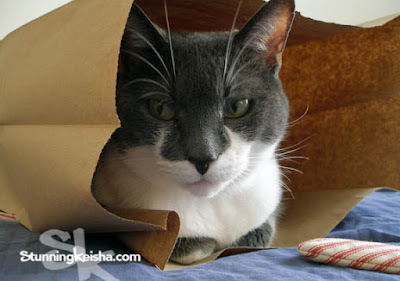 I luv paper bags - and canvas and fabric ones too. Oh you look quite comfy in that brown bag! 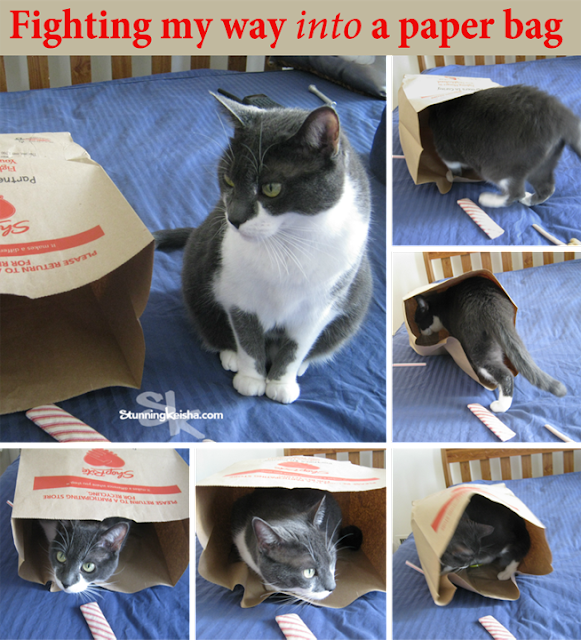 My boys love paper bags, too! Those bags are so much fun and at least you don't have a sister that eats your bag CK! OH CK you are a poster cat for paper bags! Very cute indeed. MOL! You are funny. My kitties all love paper bags- and we don't get them often. CK. Those are outstanding pictures of you. I love brown grocery bags, but D gets tired of them laying around.. Gap! He is supposed to be my buddy too. We don't get paper bags very often, but they're fun to sit in... or if you're Ashton, to smash down flat and then rip holes in. Weez not play wiff bags much eever CK, but every once in a while ifin there's one in da house weez'll give a go. Lookin' good. Boff camerwas must be pawsum. I love a paper bag and Kali loves to jump on me while I get comfy inside.....sisters...there's no figurin' them out. We love paper bags almost as much as we love boxes! Hi - I'm going to give a brief update on Ghost tomorrow on the blog. I have also started an email group list for those who want to be more directly involved or just stay up to date on the situation. Because of the nature of this situation, I'm not going to post as many specifics on the blog so email me at thedailypipatgmaildotcom for more details. Thanks!!!! That looks like lots of fun! I love paper bags but hardly ever get them. It is mostly plastic bags that are used here and I don't get those to play with. Love this series of pictures! Mickey and Rufus have not been interested in bags or boxes, but it's been a while. I'm inspired to give it another try. Can The Cat Fit in The Box?